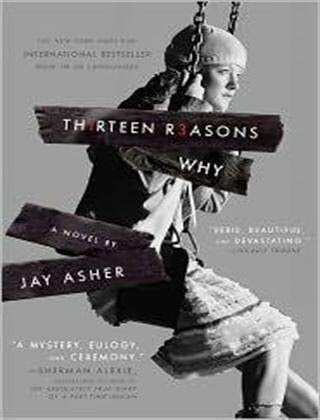 This is the story of Hannah Baker’s life leading up to her suicide. More specifically, it is her explaining (via pre-recorded cassette tapes) 13 people ( the “reasons”) who influenced her decision to take her own life. Hannah records these tapes and sends them to the first person, who has to pass them along to the next person, and so on, under threat of the tapes being released in a public and embarrassing manner. The author first wrote the story with just Hannah’s narration, but decided to tell it instead from another character’s perspective, a classmate named Clay. Clay’s role as one of the (unlucky) 13 is somewhat predictable, but this book made finding out that role suspenseful. Not Friday the 13th suspenseful or The Walking Dead suspenseful, but “just tell me why Clay is one of the 13” suspenseful. I just had to understand how each part fit into this puzzle. It is a page-turner, which is probably why it only took me a few hours to finish it. Luckily, I am blessed with a husband who will sit in a hotel room and supervise my children who were allegedly napping, while I was able to sit in 110 degree heat under an umbrella with an adult beverage, mere feet from a cool lazy river. Oh, and I got to read uninterrupted for 3 hours straight. I got caught up in my vacation and forgot the point of the description. What I liked about this book was that it had an underlying message that wasn’t hard to grasp. Not because I needed easy reading, but because I think it’s important for everyone to be able to put themselves into someone else’s shoes and see how their words and actions (or lack thereof) can impact someone else, for better or worse. Suicide leaves the ones they left behind with so many emotions… sadness, emptiness, regret, guilt, etc. I wouldn’t wish for anyone to be in a place where they felt they had no other options. The reader wants to tell Hannah she has options, that people care, and that high school doesn’t last forever. Being a teacher of elementary school children, I don’t see the issue of suicide coming up very often, but I do see bullying and misconstrued events. I have one particular student who sees everything said and done to him as being negative, even when they’re innocent words or actions. Something has gone very wrong for this child. He is not in a healthy frame of mind most of the time. If someone accidentally trips over his backpack, it is on purpose. If someone calls him a jerk, it is because everyone hates him. If he doesn’t have a partner, it’s not because he’s alienated himself, but because no one likes him. How many of us, children and adults, are doing the same thing? I want to teach my students to 1) react appropriately in response to negativity, whether it is ignoring someone or approaching the situation with maturity, and 2) remind them to respect and reach out to each other- even beyond the golden rule of treating others the way you want to be treated. What I didn’t like about this book was the topic. Suicide is not something I can relate to, and I have a hard time comprehending the state of mind a person has to be to even consider it. I won’t say anything more than any movie, book, new story, etc. about suicide makes me very uncomfortable, and I generally won’t even discuss it, because I can’t clearly articulate (obviously… ha ha) my thoughts on the topic. This was a book I initially refused to read. However, upon reading more reviews, I thought that this might be a worth-while read, and it proved to be decent. This is book 17, but I’m in week 14. Yikes- I need to stay ahead of the game. Better get reading! This is a must read. I had heard of the movie, and usually I go out and get any book that is based on a movie, but I didn’t do it then. I should have. I could have read this book for the second time instead of the first. I went through a period where I read everything about the Holocaust I could find. I read all of the classics- Diary of Anne Frank, The Hiding Place, Number the Stars, etc. In college, I had to read Survival at Auschwitz, and that started my obsession again. It’s a depressing topic to read about, but fascinating at the same time. Sometimes I feel guilty for wanting to read about it and wanting to visit a concentration camp. 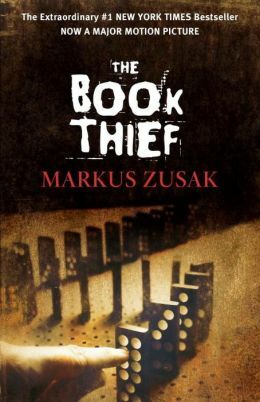 It’s a devastating piece of history that we should never forget, and good literature like The Book Thief will make sure that never happens. So on to the book… this is a story of a young girl in Nazi Germany (I LOVE that it’s from a different perspective- usually we read about the Jews’ perspective instead of the Nazis’). She is abandoned by her mother after watching her brother die (I assumed it was a mercy abandonment due to the war). Liesel did not know how to read in the beginning, but stole her first book at her brother’s funeral. When she arrives at her foster family’s home near Munich, she does not immediately warm up to Rosa and Hans, but soon forms a strong bond with Hans (Papa). Papa teachers her to read, plays his accordion, and shows her unconditional love. She also finds friendship with several others… her best friend Rudy, the Jew they are hiding, the mayor’s wife, and the crotchety old woman next door. She finds an even stronger friendship with books, and starts collecting (and stealing) them. Long story (550 pages long) short, we get to see what it was like for a young girl to grow up in poverty in Nazi Germany during World War II in a family that did not agree with the Nazi Party. We see the ups and downs of her friendships. We learn to cuss in German (I swear, I walked around calling people Saumensch and Saukerl in my head all week long). We see the power that words have, both back then and in our own lives. Liesel is a survivor, both literally and figuratively, and we find out how true that is in the end. Oh, and did I tell you the narrator of the book is Death, himself? A very cynical, different Death than we’ve read or watched in other media in the past. What I liked about this book was the change that Liesel went through. She had these powerful relationships that formed her as a person. She was able to write about her life experiences and they helped her grow. She didn’t just see the world as a poor girl in Nazi Germany. Each cloud, book, argument, etc. affected her and made her who she was, good and bad, and she was able to touch the lives of others. This book helped me see that Nazi Germany wasn’t 100% evil that we normally read about- people were people, and not everyone agrees with their government. What I didn’t like about this book was crying like a baby. But that’s what happens when you get attached to characters, and then you have to say good-bye to them. It’s no fun being reminded by your husband that it’s just a book, because when you’re reading about this girl’s life, it’s not just a book. Thanks, Denise, for recommending and lending me the book!